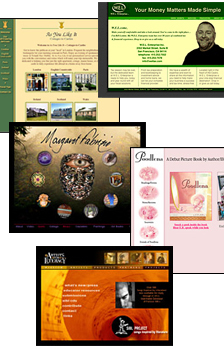 A sampling of 5 websites, I have helped to create, reorganize, or collaborate into being. Most of these sites were a first-time entry onto the web, so I registered domains, de-mystified structure and navigation of content, and in general held hands for the uninitiated. WELTax • Simplify and encourage access to the myriad money resources available; audio interviews, a daily-refreshed blog and a slew of PDFs, all brimming with tax tips and advice from this one-stop shop of financial experts. A seamless blend of CSS, Flash and HTML navigation offers flexibility for frequent content additions and regular 'makeovers' to keep it fresh for returning visitors. This former brochure site now serves the client, and their potential clients, as a welcoming entree to Weltax's friendly, full service support. As You Like It Vacation Rentals • Simple & friendly navigation to highlight their offerings and entice clients to browse by location throughout the British Isles & Paris for a home-away-from-home vacation destination. Margaret Fabrizio • A gallery site built to showcase this Artist's enormous body of work. Poodlena • Created to herald the debut publishing of a children's book & events surrounding the book-signing. SIBL Project • An upgrade for The SIBL Project to include the Artists for Literacy arm of their operation into the existing web site. Along with a massive reorganization to weed through an accumulation of duplicate information, the site now includes the music they encourage, award & publish. A site-specific video installation at 24th Street and Osage Alley in the heart of the Mission district. As a longtime photographer, archivist, storyteller and visual communicator, I've witnessed much and videotaped many of the routine and extraordinary events that have passed by my window over the years. The view has truly been an urban parade of neighbors, city workers, visitors, performers and police action at this busy and colorful corner. Interstitial Alley, a compilation and rebroadcast of this 10 year collection of video imagery reflected back from the vantage point of the same window. The 2 screens projected their concurrent ‘stories’ 6 hours a day, from 4pm to 10 pm. Viewable from street level at the 24th Street BART exodus, the bus stop, the sidewalk below, and, of course, the alley. This site is the brainchild of a group of Sanyo engineers working on the video chip installed in most desktop digital cameras. The intent of the site is to excite and inspire camera buyers to the possibilities of their new purchase with basic cam information, quick and easy tutorials to inspire enhancement of 'grabbed' images, and ongoing contests to showcase their submitted work. My part of this 2 person project has been to supply look and feel and textual and visual content. WomensNet@igc.apc.org hosted a live, evolving site to document The Women's Conference held in 1995 in Beijing. I supplied artwork for the front doors of each distinct area of their site, along with graphics prep for the countless files and imagery contributed from all being represented on the site. Consistency was achieved with color and simplicity. Design and development of a self-running booth kiosk for use at MacWorld Expos. The informational QuickTime movies highlighting the products and services, served to answer frequently asked questions for visitors to the booth and explain the vast product line and membership bundles available. Revisions were done annually to reflect price ($ to ¥) and product changes to this highly portable, musical (!) and easy to use display. Design and development of 3 BMUG CD-ROM projects available concurrent with the version releases of QuickTime. The TV-ROMs are eclectic collections of QuickTime movies providing a source of publicly distributable movies to the experimentally curious. Besides providing the user with a variety of ready-to-play-with MooV files, the HyperCard stack front-end serves as a dynamic library for browsing or viewing each MooV which subsequently acquaints the user with this emerging technology through an interactive learning experience. A shareware collection of Internet downloadables on a ROM. I did the file interface work in HyperCard for this disk which involved scavenging the Read Me docs with each piece of shareware and summarizing the jejune info and dumping it into a Hypercard template of my design. The stack was then converted to a QuickTime movie to step through the information or slide the Controller to the area of interest. Design & development of a Promotional Stack distributed on-disk at two consecutive MacWorld Expositions through BMUG (Berkeley Macintosh Users Group). Intended as a Browser Stack to quickly acquaint out-of-town visitors with the cultural, historical, recreational and gastronomical aspects of San Francisco, it subsequently generated income & interest from the Expo attendees for BMUG. v. 2.0: Further enhancements to original stack. Auxiliary Map Stack designed to implement HyperCard 2.0 newest capabilities. Design & development of on-site interactive video performances using consumer equipment and analog videotape. Extensive experience on a variety of projects with all aspects of production; talent coordination, lighting & camera work to obtain source footage, deck to deck editing, schlepping & setting up heavy equipment, troubleshooting during live feed, and on-site camera & tape operation. Digital Media teacher for incoming 9th & 10 graders entering the FAIS-IHS Upper School. A full-time, part-time job that included weekly classes, building an online curriculum to acquaint the freshmen with the TechLounge computer lab and its network's capabilities. Teaching basic empowerment skills through knowledge of the available tools and resources to create web pages and interpretative art and movies. The online tutorials and classwork for the class of 2003, 2004 and 2005 are in use as ongoing curriculum and web presence. Katrina Garnett's Summer Computer Camp for high school girls exploring a career in computer science afforded me the pleasure of photographing the girls and preparing a Morphing workshop to acquaint the attendees with the mechanics and science behind special effects software. The use of their personal images in the process made for an enjoyably amusing afternoon. One full day of digitally photographing 3 classes of 30 girls each, transferring the files to networked computers shared by two-girl teams to teach the basics of morphing between 2 digital images. Each girl produced several QuickTime movies that showed the change between their images or various animals and famous women in history. The conference promoted an increased awareness of math and science and the career opportunities in related fields for young girls. D*LAB's Tapestry, a 6-week summer camp program for kids aged 12-18, served as an extension of the Digital Storytelling Workshops taught at SFDMC. The curriculum included mastery of Photoshop and Premiere skills with the express purpose of finishing a homemade digital movie for output to videotape. As Production Tutor in the Tools of the Trade area for both MM Playgrounds at the Exploratorium, I was able to interact with curious visitors of all knowledge and experience levels; dealing with their anxieties associated with the new technologies, generally demystifying and hopefully inspiring further exploration of the tools, and holding my own with those that preferred techno-banter. Hand holding and instructional guidance for first time computer users to bring them up to speed in this digital world. Primarily Macintosh in focus, but have found an increasing number of Windows clients knocking on my door for my efficient and encouraging style of teaching. Teaching and facilitating ongoing workshops with the express purpose of finishing a homemade digital movie for output to videotape. Off-site production work on various Pagemaker, Illustrator and PowerPoint files for print and electronic distribution. This Project management training group revamps and revitalizes their materials (workbooks, handouts, and slide shows) to personalize for an ever growing roster of clients. Page mark-ups for changes come from a variety of sources and styles, from paste-up to pencil notation. Off-site production work on the 900+ separate files that comprise Northern California's Disclosure Form and Evidence of Coverage booklets. Formatting and system-wide regulatory language updates to these documents extended to the complete line of Group Plan coverages sent to the membership. Besides file synchronization and archiving at 2 different sites, I was required to interact with outside vendors to facilitate delivery of hard copy to the client in a timely manner. Off-site production work to realize completion of various projects from White Papers to business cards and ultimately reduce the workload of the very harried staff at this software company. Desktop production work on any and all projects pending, including flyers, brochures, mailers, as well as 400+ page Newsletters; editing and indexing of this bi-annual 'book' as well as contributing articles for publication. Design & illustration of 300+ page hands-on instructional book. Required editing, embracing & translating the technical information into laymen's terms. Subsequently translated for the German and Japanese markets & presently used as a basic classroom text in physics at UC Berkeley. Also claims the distinction as the first publication to include an actual Dichromate hologram and the world's best selling book on holography. Ongoing workshops, seminars and classes to maintain cutting edge understanding of developments in DTP, multimedia, web design and a variety of intriguing software packages.